I have been busy making a "Mug Mat" this week. I entered a swap over at Donna's Blog! Please click onto the picture on my side bar for more info!! There is still time to join this great swap which is open till February 1st.! As a few of you might know I love to draw and paint. 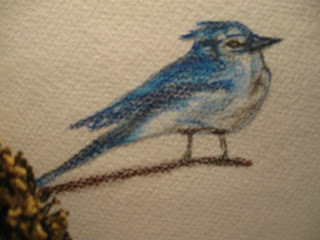 I made this little Blue bird with Oil Pastels and pencil. I would like to make a series of birds for a nature journal this year. I will post a different bird as I go along throughout the year to show you my progress. I am self taught and not an expert by any means. I just love doing it thats all. I also wanted to share this darling little pillow with you...(which I did not make). I found it at my favorite Antique Mall and think it is just so adorable!! Don't you? The key is vintage as well as the fabrics.